With the recent passage of California Proposition 64, it is now legal for adults to possess and consume cannabis in the state. Though you no longer need to have a medical recommendation, many state officials have taken swift action to ensure recreational marijuana is safe for the user and others around them. Learn about the most recent bills up for consideration if you partake in or plan to consume marijuana in the state of California. Because marijuana impairment cannot be tested the same way as alcohol intoxication with the use of sobriety tests like a Breathalyzer, Assembly Member Tom Lackey introduced a process of testing via saliva. Assembly Bill 6 suggests police officers should require an oral fluid test as a measure of the saliva concentration of marijuana. While Colorado and Washington have established a baseline of 5 nanograms of THC per milliliter of blood, little scientific research exists on the relationship between THC and impairment. Critics argue this point along with the fact that Prop 64 didn’t set such a limit and that law enforcement officials could make an arrest on discretion alone. Further, they state saliva tests have not been proven as effective measures of concentration to begin with. Far less ambiguous than Assembly Bill 6, Senate Bill 65 proposes to make all marijuana consumption illegal while operating a vehicle. Even the biggest advocates against marijuana usage are hard pressed to find an argument for such legislation—especially given the fact that the same restrictions do not apply to alcohol. 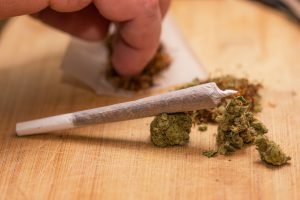 Drivers who are found to be either smoking marijuana or ingesting a marijuana product (such as an edible), would be subject to either an infraction or misdemeanor. Applicable penalties would apply such as drug education classes and fines. Dr. Jim Hedlund, a former senior official for the National Highway Traffic Safety Administration, conducted a survey and confirmed what many marijuana advocates have been saying for years. The study’s two major conclusions may prevent such driving-related marijuana bills from passing. Drugs are complex and not widely understood. In short, it’s difficult to make a definitive distinction between marijuana concentration level and its ability to impair a driver. This is because individuals vary in absorption and metabolic rates and they simply cannot be tested using similar standards of BAC limits. Marijuana can exist in the body for weeks after use making it nearly impossible to link signs of impairment during a traffic stop. On the opposite end of the spectrum, impairment effects can last for hours after marijuana use while concentration levels drop significantly within 15 minutes to one half hour. Impairment, therefore, would be subjective. The result would make any forthcoming laws very difficult to enact fairly and effectively. Although bills are not yet laws in the eyes of police officers, it’s important for consumers to understand that the introduction of recreational marijuana is very much a gray area in states that have allowed its usage. By respecting the drug as you would alcohol—especially as it relates to driving and impairment, you will be able to enjoy it responsibly without consequence. Contact Jon Artz today if you need to speak with an experienced Los Angeles DUI Lawyer. The fastest way is by calling: 310-820-1315.